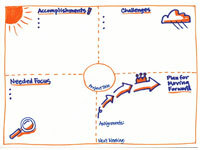 Periodically it is helpful to meet with your team to check your progress on your Accelerated Action Plan. 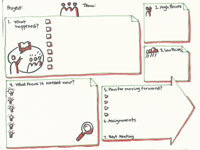 Here are two templates you may find helpful to guide and record your discussion. Team Check-In_Template 1: Allows you to zero in on the accomplishments and focus on challenges to be resolved to move forward. Project Check-In_Template 2: Allows your team to tell the story of what has happened, including high and low points, to develop a plan for moving forward.